I got an email saying this book had been checked out to me and I should look for it on my bookshelf, but when I open the OverDrive app it's not there. - Ask Us! Q. I got an email saying this book had been checked out to me and I should look for it on my bookshelf, but when I open the OverDrive app it's not there. I'm not sure what happened here. Did I miss it because I didn't log in for a few days? Unfortunately, OverDrive has decided to call two different things "Bookshelf" even though they do different things. 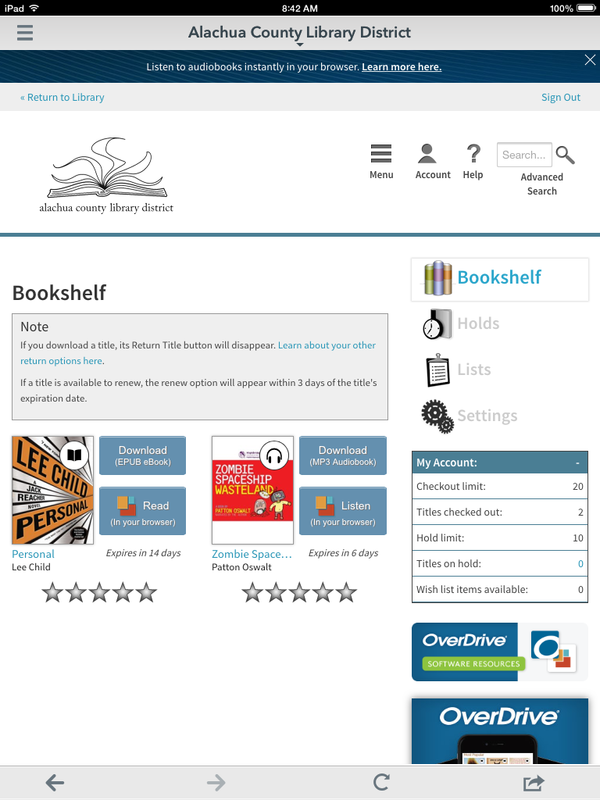 The site's Bookshelf shows everything that you have checked out through OverDrive, regardless of whether it's downloaded onto any of your devices. 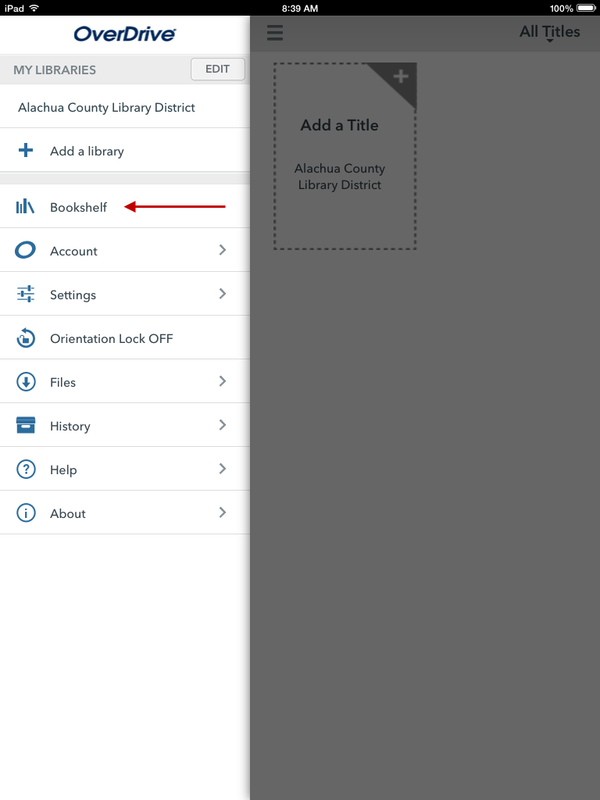 This is the Bookshelf accessible from the OverDrive collection, which you can also get to in the OverDrive app, by tapping the Menu icon (the three stacked lines at the top left) and then tapping "Alachua County Library District." Once you're in the OverDrive collection, if you tap on Account and log in, you'll be taken to the site's Bookshelf, shown below. 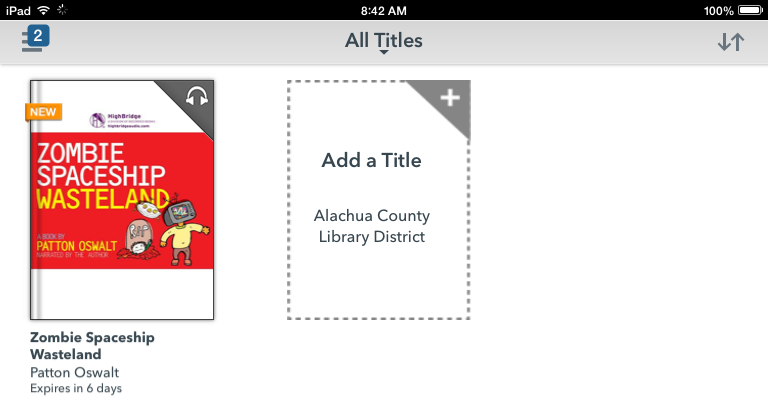 Once you've downloaded a title from the site's Bookshelf, you'll get a message that the title has been added. If you tap on the Menu icon again (the three stacked lines at top left) another Bookshelf will be listed there. This Bookshelf is the one which eBooks and audiobooks get downloaded onto, and it will only show what's been downloaded on that particular device. Once a title has finished downloading, you can read or listen to it here with your WiFi off. If the title still isn't showing for you once you log in to your account in the OverDrive collection, or if you have any other questions or comments, please let us know and we'll be happy to help.